A bridge over the Reedy River in Greenville, Upcountry South Carolina. 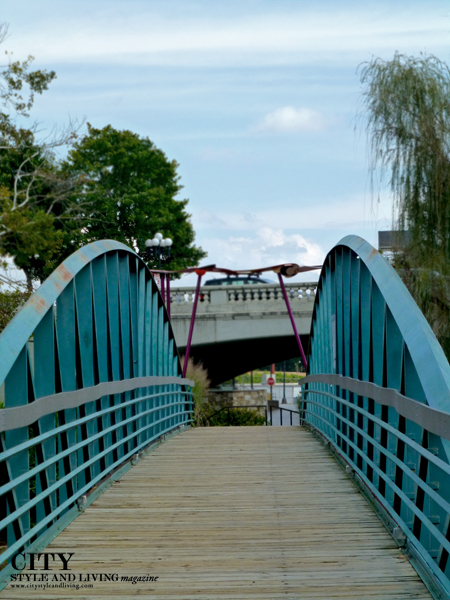 The entire downtown of the city has been revitalized and there are several bridges and parks near the river making for delightful strolls, jogging or biking. 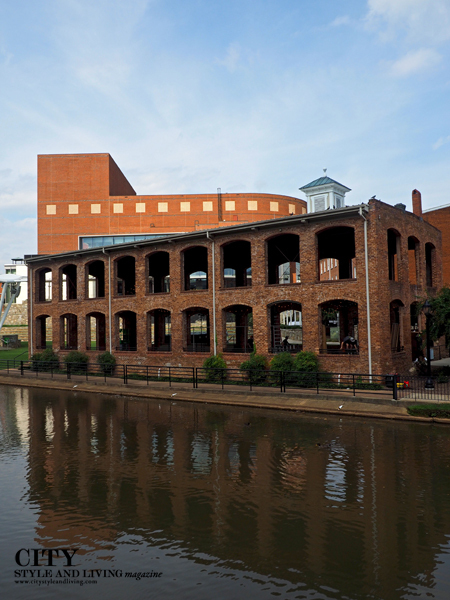 It is easily accessible from Greenville's Main Street. 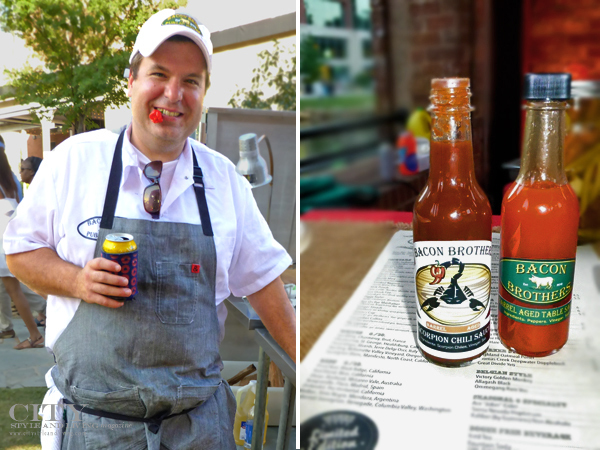 A wonderful discovery in Greenville was Bacon Brothers a highly noted restaurant which also produces amazing hot sauces including one made from the scorching hot scorpion chili. Left, executive chef Anthony Gray (with a Carolina reaper, the hottest pepper in the world in his mouth) and right, the bottled hot sauces. Attendees at one of several events at Euphoria a food and music festival in Greenville, South Carolina celebrating its ninth year. 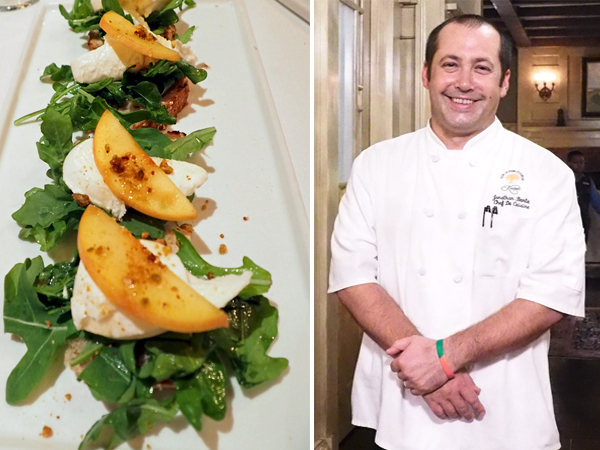 Ken Vedriski executive chef, owner and sommelier of Trattoria Lucca in downtown Charleston, South Carolina prepares dishes for a Euphoria event. 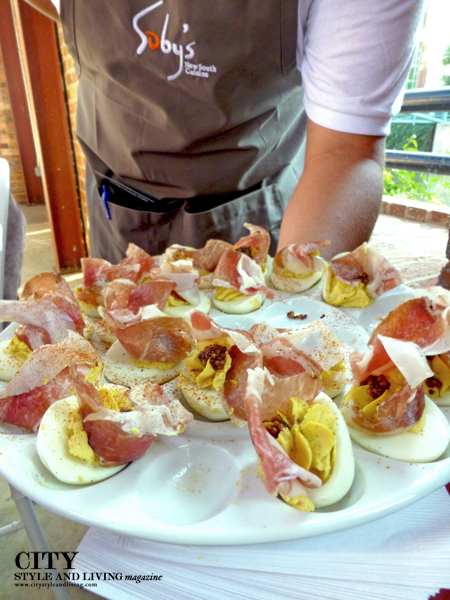 Soby's New South Cuisine of Greenville presents a deviled egg dish. 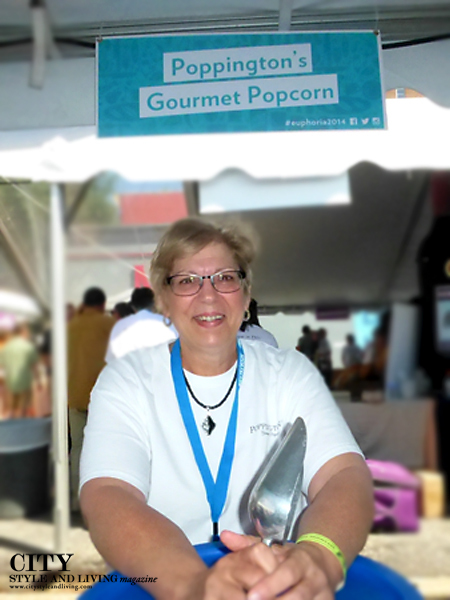 Poppington's Gourmet Popcorn co-owner Rose Augustyn serves delicious flavoured popcorn, we loved the white cheddar which was richly flavoured, the Greenville Mix and the spicy Louisiana Cajan Flare. 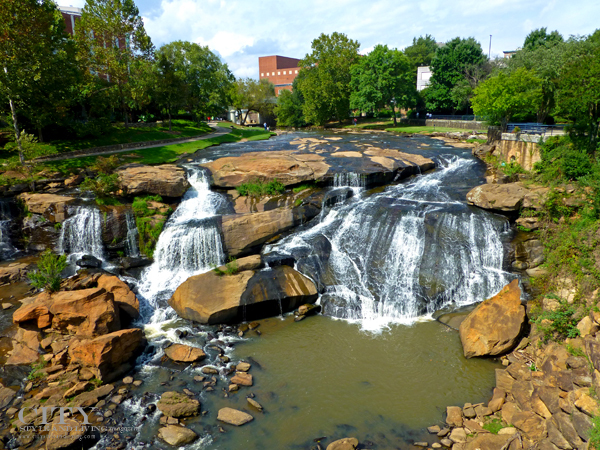 Falls Park on the Reedy formerly the site of the city's textile mills, is centered on this waterfall in the centre of Greenville, South Carolina. Also check out the Liberty Bridge, a modernist treat. 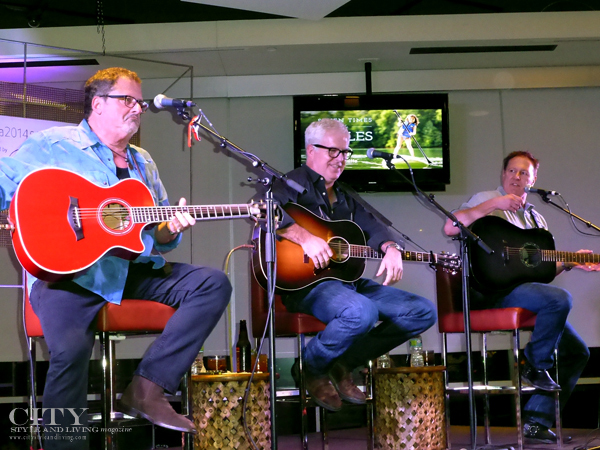 Songwriter’s Recipe: Songs and Stories with legendary songwriters (left to right Bob DiPiero, Rivers Rutherford and Tim Nichols). With heartfelt personal stories and passion in every performance, this was a highlight of our South Carolina sojourn. The Greenville Saturday market gives shoppers the chance to meet farmers face to face. Everything from mushrooms (anyone heard of chaga?) to exotic hot peppers (including the Carolina reaper), plants and okra the size of your arm were on display. This stall (pictured) from Lanherne Farms piqued our interest not only because of the the vibrant array of colours but also because they garnered a long line-up. 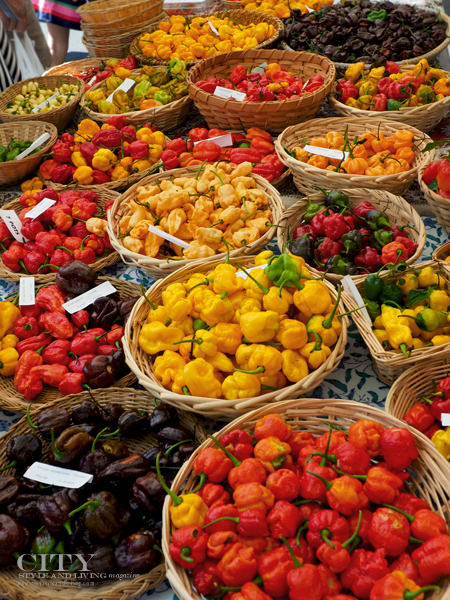 Featuring chili peppers that range from mild offerings to innocuous-looking but mind-blowing scorchers, the farm grows the largest selection of peppers in South Carolina. South Carolina grows more peaches than Georgia (who knew?)! We asked around everywhere to see if we could get a peach (this year's crop was apparently not great, and we were a few weeks too late we were told). 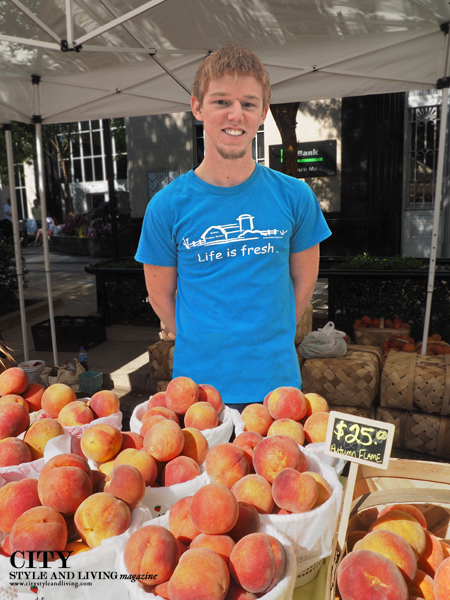 Lo and behold, the young gentleman (pictured above at Greenville's farmers market) offered us a ripe juicy peach from his stall, Bellews Market. 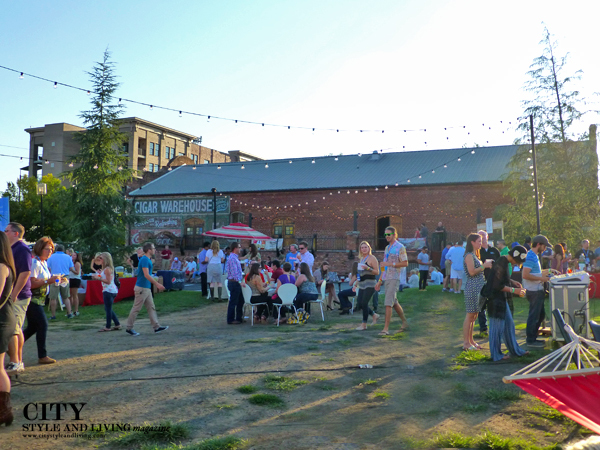 A look at Wyche Pavillion, a gorgeous venue on the banks of the Reedy River in Greenville South Carolina, it was once a carriage house. This place lights up at night, and is also home to dozens of weddings. 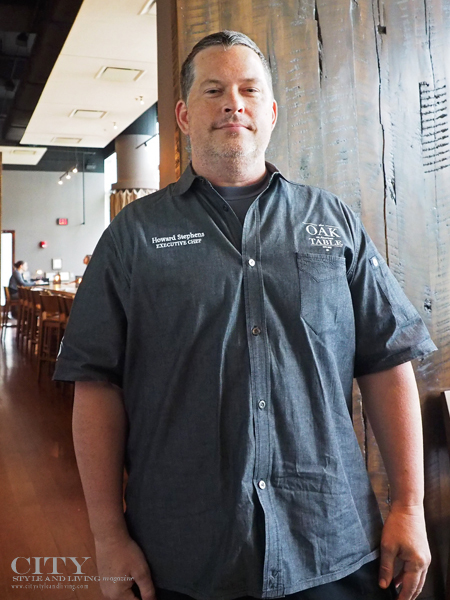 We were lucky enough to meet three of Charleston's brightest culinary talent. Left to right: Executive Chef Nico Romo (Fish restaurant); and Chef Nate Whiting and Chef JD Coleman (both of 492 soon to be opened in Charleston). 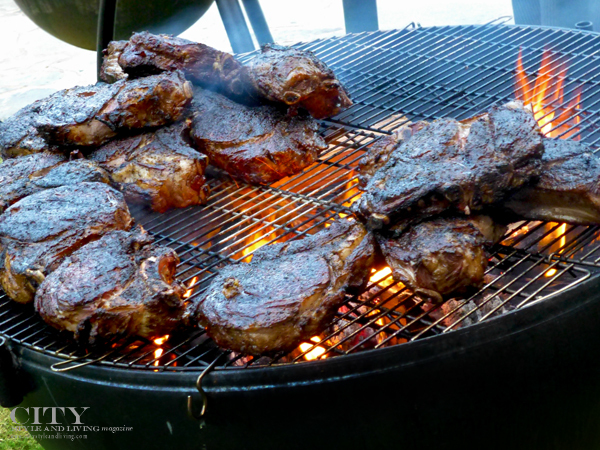 South Caronlina barbecue: Sunday Supper featuring Chef John Currence, Chef Anthony Gray and Chef Shaun Garcia. 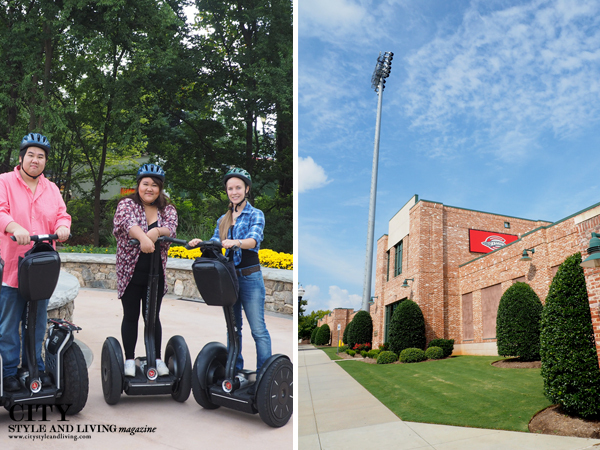 A fun and informative way to see Greenville is by segway with Greenville Glides . We stopped at Fluor Field just across from Shoeless Joe Jackson's home/ museum. In Upcountry South Carolina, on the grounds of what was formerly a schoolhouse and the setting for a Disney movie we went ziplining with Wildwater. Our guides Heather and Nate were hilarious and encouraging as we flew through the air over water and forest. 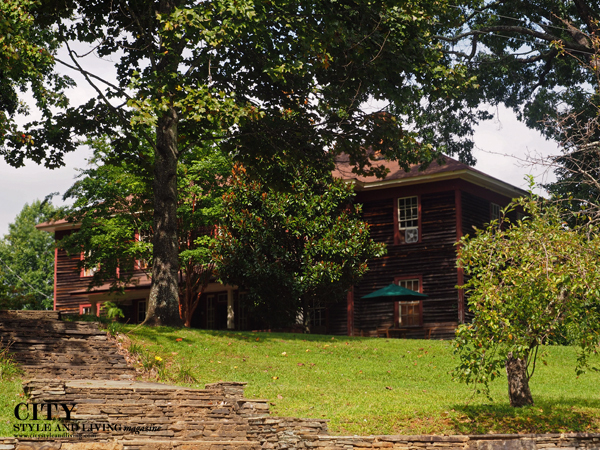 Ah the peace and tranquility of stunning Chattooga Belle Farm in Upcountry South Carolina. 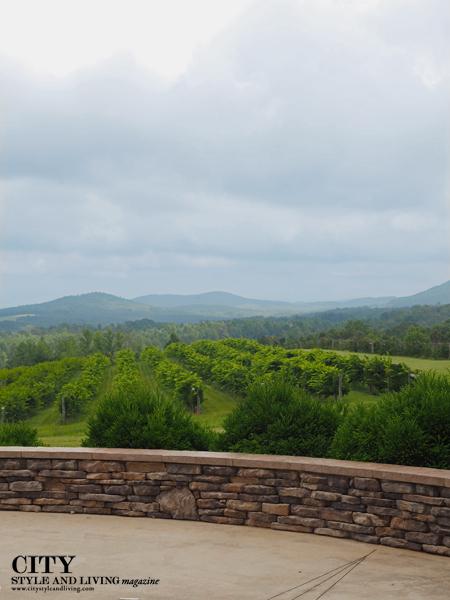 A former apple orchard located in Upcountry South Carolina, Chattooga Belle Farm is an agro tourism marvel with sweeping views of neighbouring North Carolina and Georgia. A popular wedding destination, the farm makes their own wines from the local muscadine grape and from various other fruits (try the apple and peach). The farm also grows exotic fruits including goji berries, arctic kiwi and paw paw. Owner Ed Land is often on hand to personally greet visitors and share stories. 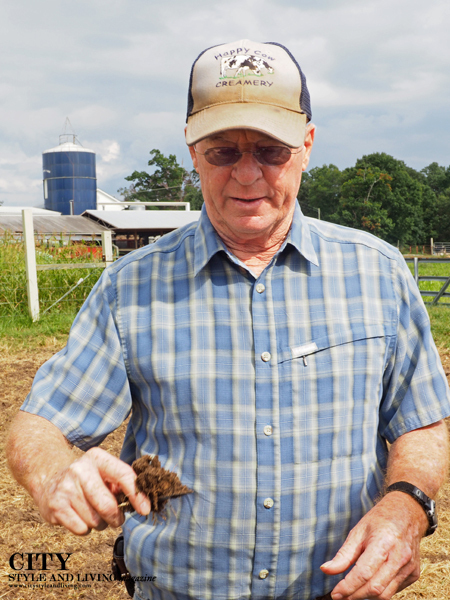 The legendary Mr. Trantham, owner of Happy Cow creamery shows us the rich organic matter in the farm's soil. A lovely man with an incredible story - morphing his dairy farm into a fertilizer-free pioneering dairy farm. During one of the worst droughts in state history he mobilized farmers and coordinated cooperative efforts between farms across the country. Trantham is also the first recipient of USDA’s Madden Award, a national honor that recognizes those who prac­tice environmentally sound farming. Definitely come to meet the cows and see the farm (the milk goes from cow to bottle in only 48 feet) and speak with Mr. Trantham but do try the chocolate milk (thick and luscious) and ice cream. If you're driving the on site shop even has a drive-thru window! 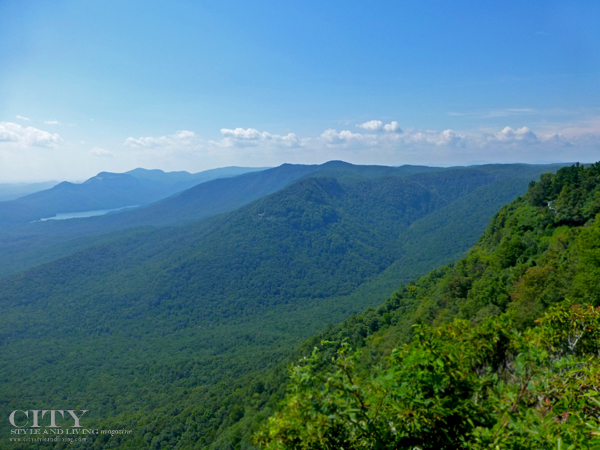 A look at the lush Caesers Head State park. There were several bird spotters with binoculars primed for counting the many hawks moving through the area. We spotted a peregrine falcon on our visit. 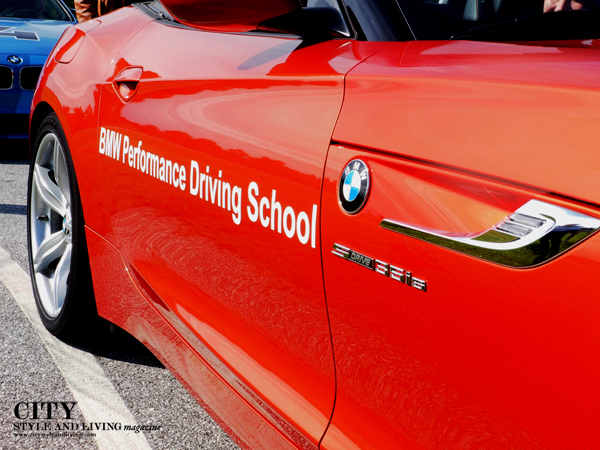 BMW Performance Driving school , a mecca for adrenaline junkies this was a heart pumping excursion that allowed us to test drive 5 BMW models, and ride the BMW X5 (Made in South Carolina) through an off road obstacle course- at one time driving down a rocky vertical incline on two wheels no less! This also includes a factory tour and BMW Zentrum (museum). 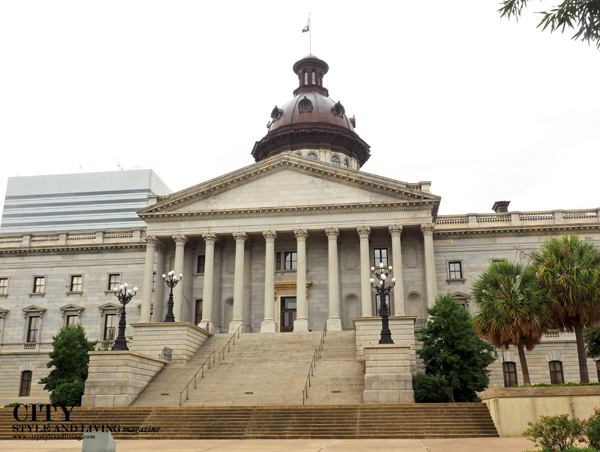 A look at South Carolina Legislature building. Inside, the beautiful building has marvelous architectural style and history. 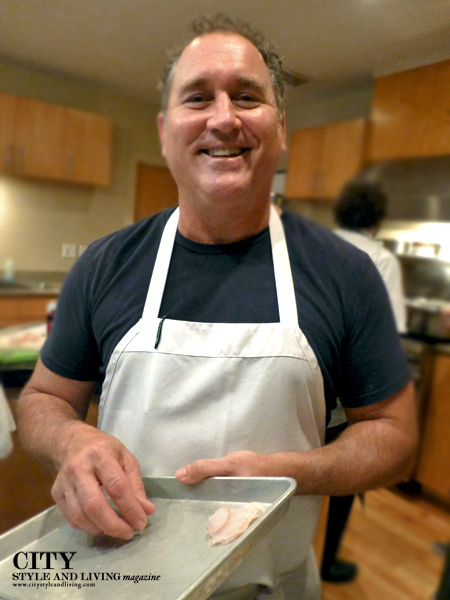 Chef Howard Stephens of Oak Table restaurant in Columbia. 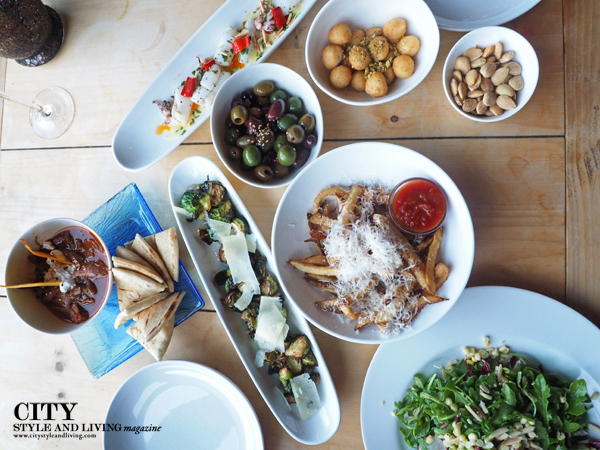 Chef Stephens has a simple style, working with fresh and eclectic ingredients allowing natural flavors to come out in his plates. He infuses Asian flavours and other exotic ingredients in his cooking. 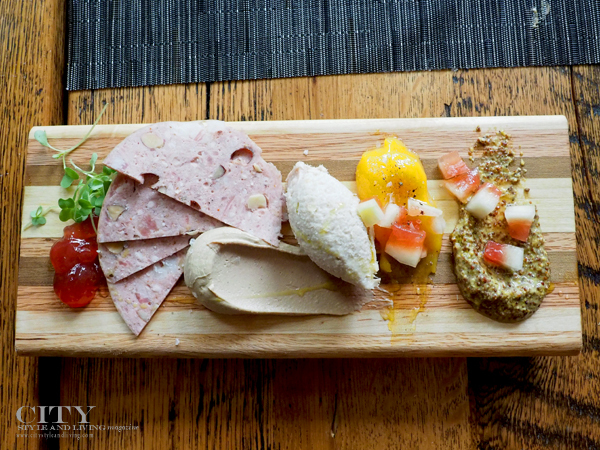 Chef Stephens of Oak Table in Columbia South Carolina prepared a delicious charcuterie board, including chicken liver pâté, pork rillettes, egg yolk and muscadine jelly. We also feasted on an outstanding array of dishes including house made kimchi with boiled peanuts, pimento cheese, cripsy fried oysters, sriracha fries, and fried chicken. Talented pastry chef Charley Scruggs brought out a trio of desserts including s'mores, roasted fig napoleon, and 'coffee and caramel'- finesse and skill written all over. 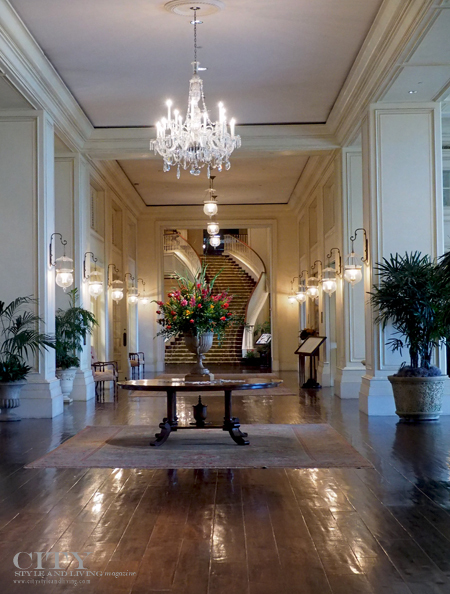 The Mills House Wyndham Grand , our base while in Charleston - a beautiful hotel with a typically southern style. 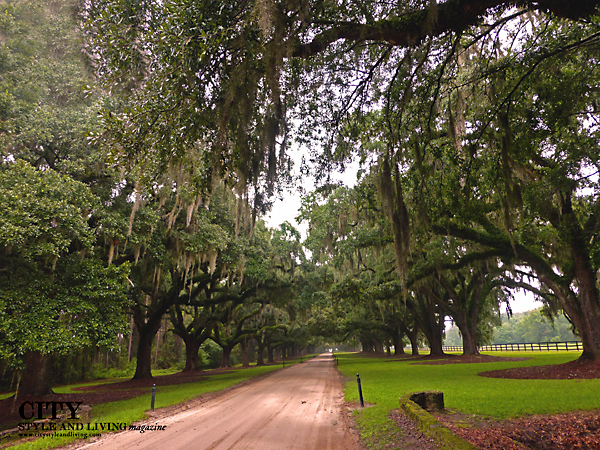 The Spanish moss hangs off of the branches of oak trees lining Boone Hall Plantation, founded in 1681. We toured the house, slave quarters, and plantation grounds in the pouring rain. Nothing could dampen our spirits- this is a daydream of a destination. 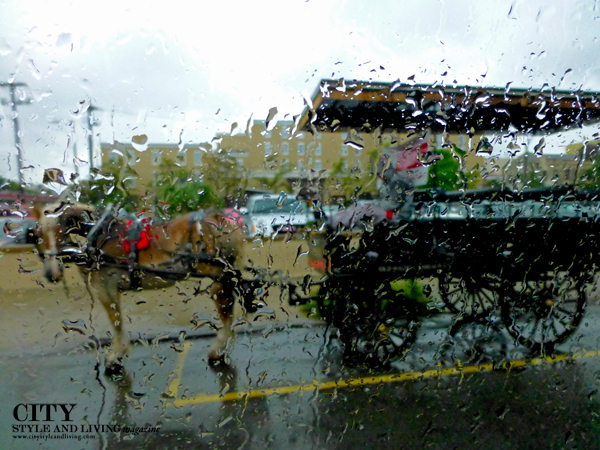 Taking a carriage ride in the rain. Our carriage guide, Jenny made the experience truly enjoyable with anecdotes and history along the way. 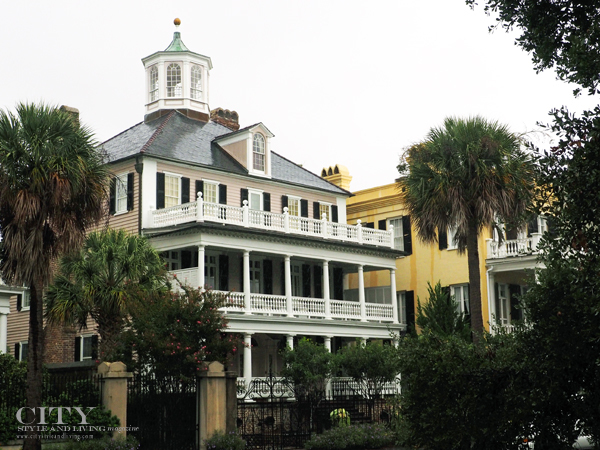 One of the enormous mansions lining 'the Battery' district in Charleston. 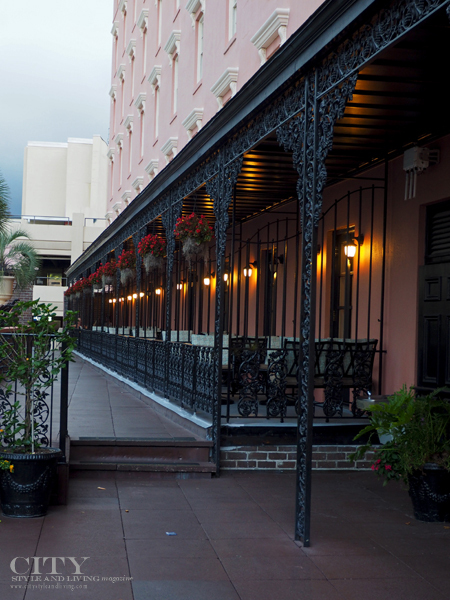 Halls Chophouse in Charleston, a family owned and operated restaurant. Pictured here, the bison and risotto. We also tried the mac and cheese, collard greens, spinach, and sauteed mushrooms. 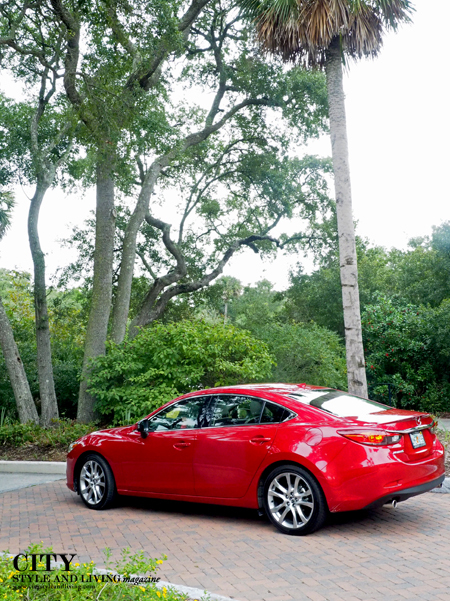 Our 2015 Mazda a6, a mid size sedan equipped with Skyactiv-G 2.6l engine took to the South Carolina roads beautifully. We loved the directions given by our Australian Tom Tom gps navigation system that didn't fail us once, the blind spot monitoring system warning us of cars on either side of the vehicle, and keyless entry. Our drive was easy as pie. 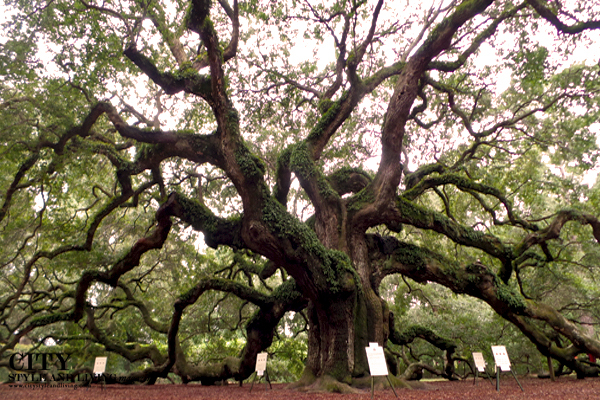 A look at the Angel Oak tree on Johns Island. The beautiful tree is estimated to be at least 400 and as much as 1400-1500 years old. It stands 66.5 ft (20 m) tall, measures 28 ft (8.5 m) in circumference, and produces shade that covers 17,200 square feet (1,600 m2). 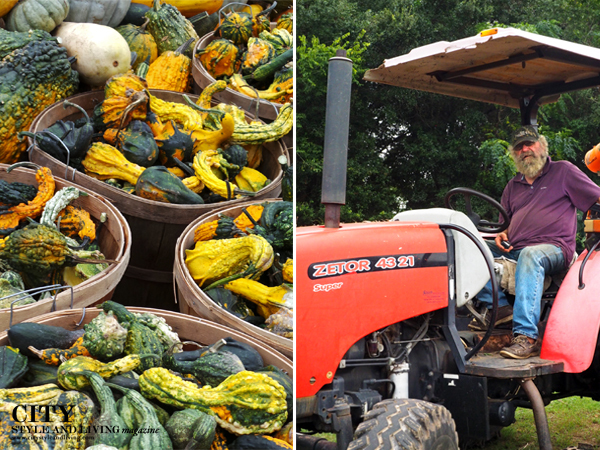 Another local legend, farmer Sidi Limehouse of Rosebank Farms on Johns Island with produce ranging from pumpkins, tomatoes, and corn to peaches and flowers. 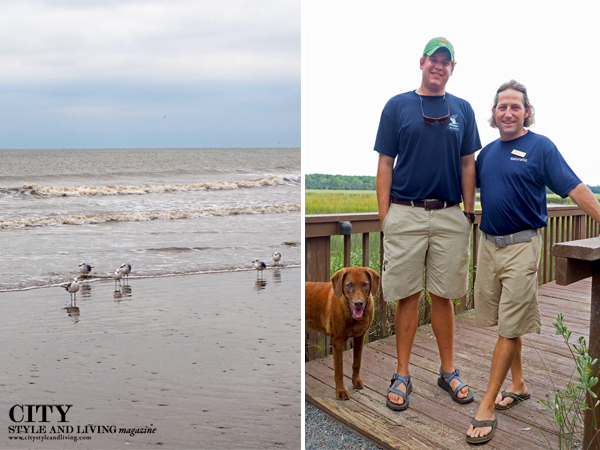 Driving up to Kiawah Island Golf Resort, we were instantly welcomed to The Sanctuary. Walking into the lobby (pictured above), we were in awe of the spacious yet cozy interior, decorated with classic elegance. 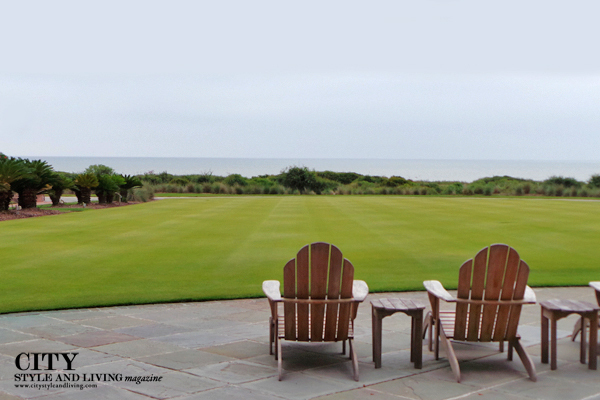 A peaceful look at the marvelous Sanctuary at Kiawah Island Golf Resort. 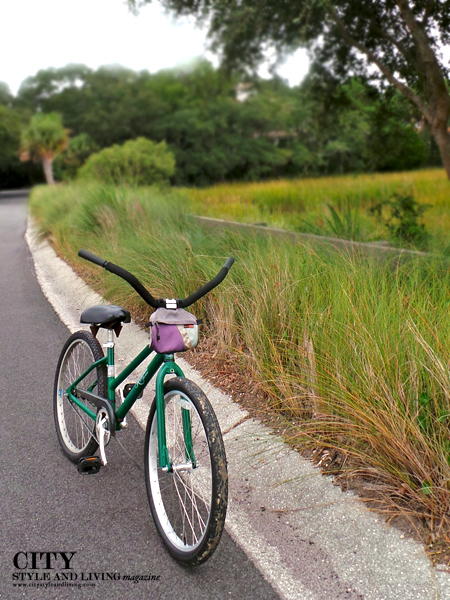 We rode our bikes for 2 hours with Julianna our guide for a nature tour around Kiawah Island Golf Resort- and were fortunate to see an alligator with her little ones. Another day, we paddleboarded (against the tide and with high winds of course) with Marcie. The resort offers so many activities and excursions that it was hard to choose just a few. 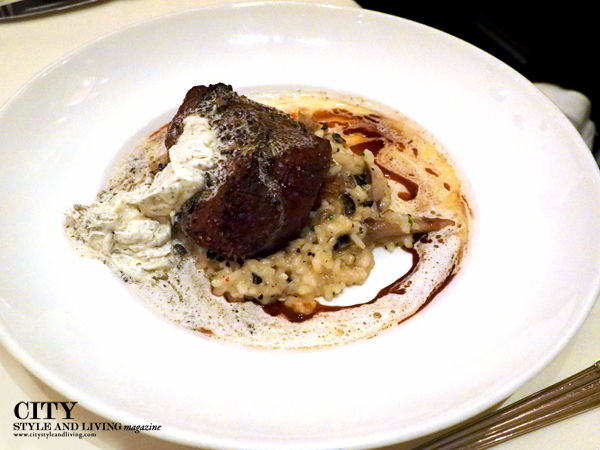 Our last night at Kiawah Island Golf Resort, we had a truly delicious dining experience at The Atlantic Room. Chef Jonathan Banta (right) is skillfully able to fuse bright flavours. The peach and burrata salad (above left) was sweet and savoury, while the mussels were imbued with a spicy kick of red chili. Our lobster with fried potato, creamed corn, and lobster demi glace was a play on the sweetness of produce and the sweetness of the ocean while the crab rangoon with red curry, coconut milk, cilantro, and Carolina gold rice was a standout. “Golf or Gourmet Escape” package from November 9, 2014 to February 27, 2015 (guests have their choice of accommodations (Sanctuary Hotel or luxury villa) plus either two rounds of golf, two dinners, or one of each). This would be perfect for those wanting to escape the cold of Canada to the relative warmth of South Carolina. (Think nice golfing temperatures in January). Left: Kiawah beach. 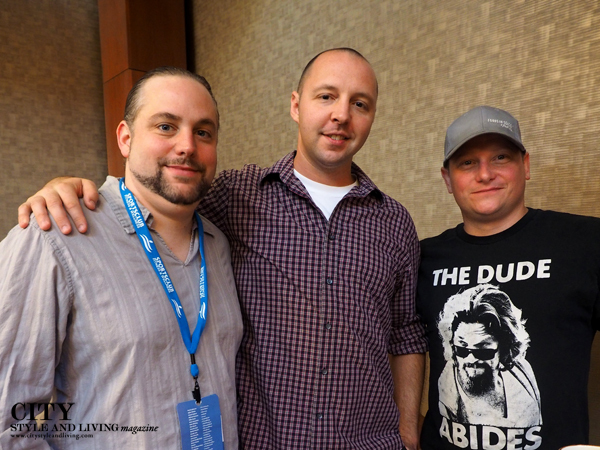 Right: (from left to right) Cooper, Matt and Jake. All at Kiawah Island Golf Resort. One day, observing bright purple berries near a parking lot, we met Jake who popped out of his truck almost on cue to reveal to us that the name was the 'beauty berry' (he actually quoted the full latin name) - throughout our stay, we bumped into Jake, who always had a smile and good conversation. We met Matt and his dog Cooper on our dolphin excursion - the avid birder kept us laughing the entire trip with his 'nature humor' and stories about his recent trip to Africa. Matt was able to spot birds instantly including a bald eagle, and great blue heron (GBH as he calls it) as well as a small shark and of course the graceful dolphins. 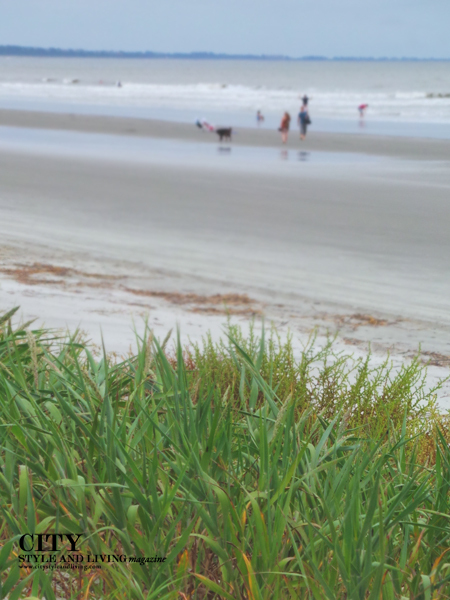 During our stay at Kiawah Island Golf Resort, we were fortunate to meet the most warm and generous staff, oozing with Southern charm and grace. Thank you all for a most memorable experience that we shall never forget. Pondering a trip to the States? Already booked your flight? Cancel your plans to any other state in the union and go instead to South Carolina. It is THE place you need to visit now. Yes there are mystical oak trees shrouded with Spanish moss, there is the postcard city of Charleston with an amazing food scene, the revitalized city of Greenville, there are beaches and mountains and forests beckoning visitors but the reason to visit is and we hope always will be because of the people. 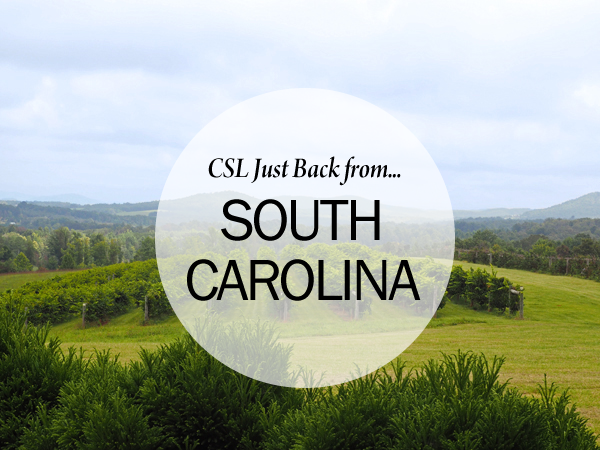 Want more South Carolina? 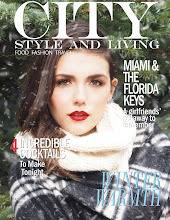 Look for a travel editorial in the upcoming Winter 2014/15 issue of City Style and Living Magazine. Did you like it more than Miami? And did you manage to check out the Edgewater Condos while in Miami (link for the interested: http://ionmiamicondos.com/)?